NOTES: Storm Shadow is one of the most popular GI Joe characters and his version one figure is highly prized. The white plastic of Storm Shadow will commonly fade to a yellowish color and the price will largely depend on if there is any fading. 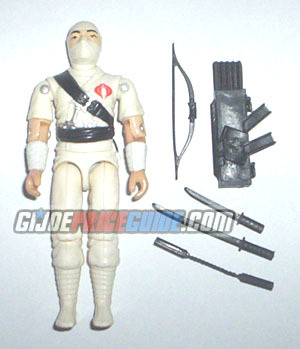 A complete, mint, "snow white" Storm Shadow with an undamaged cobra symbol is not easy to find. It is also common for the black bow to be broken.